Designed by Ken Trew in 1987, this memorable jumper perfectly sums up Sylvester McCoy’s enigmatic Seventh Doctor: whether he’s destroying a fleet of Cybermen, battling Haemovores with lost faith, or blowing up the Dalek homeworld, you can never predict this manipulative incarnation of everyone’s favourite Time Lord. The Seventh Doctor era has had a truly-deserved renaissance of late, its most famous fan being Lord of the Rings director, Peter Jackson – who owns the original costume! Combined with Lovarzi’s Seventh Doctor Silk Scarf, this jumper (which comes in its own special carry case) is quintessential for cosplayers and fans of the homeless traveller and his old police box, his days like crazy paving. LOVARZI is the authorised licensee of the Seventh Doctor Jumper. 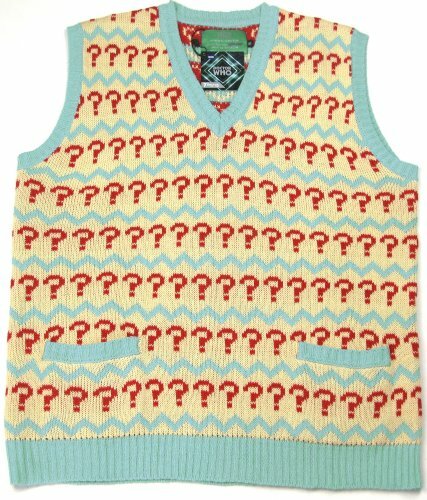 This Seventh Doctor Jumper is perfect for all Whovians: for collectors, for cosplayers, for keeping you warm in the winter!